Calling all Daughters of Zion, Men of Valor and all Saints of God! The Holy Ghost is on the move again and is calling you to report for duty at “The Cross Walk”. 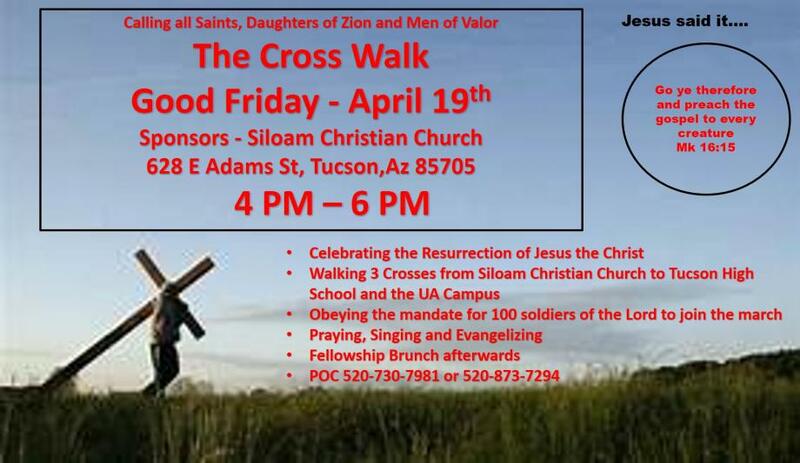 The Siloam Christian Church is organizing the event to walk 3 Crosses from Siloam to Tucson High School and various stops at the UA campus. We will be praying for places and people, sharing the gospel and evangelizing the community while telling people about the wonderful news that Jesus Saves as we celebrate the resurrection of Jesus the Christ the Son of the Living God. We will have a fellowship brunch at the end.